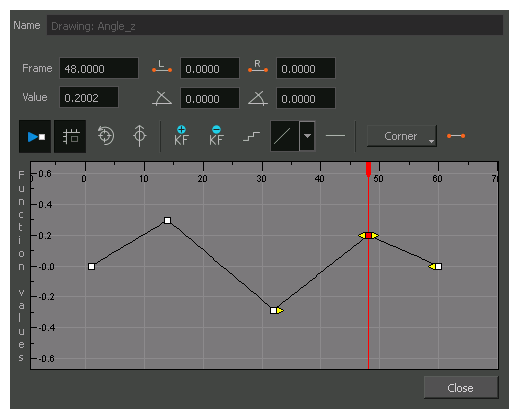 You can display a parameter's function curve and adjust the easing with the relevant controls. In the Timeline view, click the Expand button on a layer or press Alt + F.
The layer’s functions are displayed. Double-click the desired function. Note that 3D Paths have a specific velocity curve controlling the X, Y, and Z axis together. You need to click on the Position:Velocity layer. The Function Editor opens as the Bezier Editor. The editor will not be displayed if the function does not already exist.